Show season started for me at the beginning of November when my Contra Costa Mineral & Gem Society had its annual show. 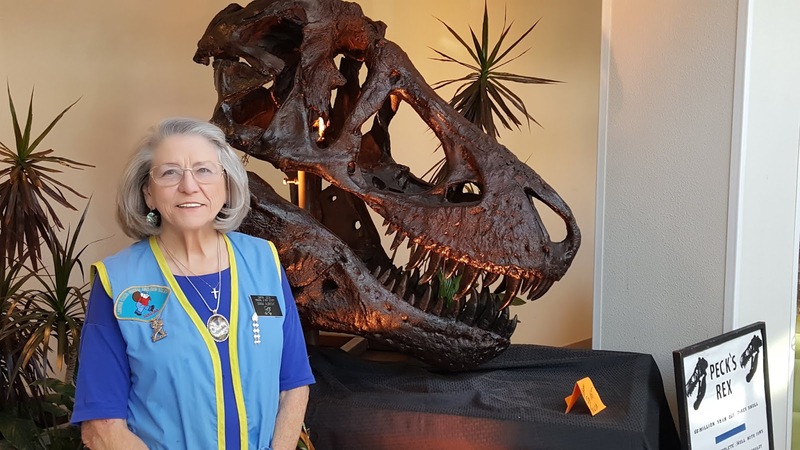 This year our lobby was decorated with a full-size replica of an actual dinosaur head! As far as I'm concerned, rock shows are addictive! I love the way many online slab sellers are very meticulous in describing their slabs with multiple photos and exact measurements. They're the real pros. Yet, online, it can be hard to tell if the piece is a smidge too thin or thick for the shapes you'd like to create with it. Does it the same thickness all the way through or does it tend to get thinner as it goes across? Does the texture of a mixed material change indicating a possible problem with undercutting? Are the cracks fully healed or do they catch your fingernail? The good dealers will tell you everything you need to know, but not every dealer does. I see shopping for slabs and rocks as a sensory experience so I prefer to do it in person. I've also come up with some thoughts about what I've learned I'd like to share with you. DOG GONE IT If the show is indoors, don't plan to bring your dog. Yes, Fido goes rockhounding with you, keeps you company in your shop, and loves everyone, but no. I know many indoor venues do not allow pets, period. Don't snicker and think you've seen the dealers inside these "dog free" spaces who have a dog or two hidden behind the skirt of their tables. It's one of those don't ask/don't say things, but it doesn't mean your pet is welcome. Their dogs aren't out in the aisles bumping into the attendees or (for larger dogs like mine, sweeping merchandise off the tables with their tails). And for goodness sake, don't get one of those fake "Service Dog" vests so you can bring your dog in. Believe it or not, everyone else can see that your dog is not a properly-behaved service dog and they (including the vendors) know that if you'll cheat at that, they can't trust you. Leave the service dog designation to well-trained animals and the people who actually need their help. If the show is outdoors, Fido is likely to be very welcome and a great conversation starter. BRING YOUR OWN BAG(S) Get one or more reusable bags that are strong enough to carry 30 lbs or more. Some can be folded small enough to tuck into your back pocket until they're needed. Vendors are prepared to wrap your slabs or other purchases, and they often put them into plastic bags, like the ones from the grocery store. These thin plastic bags are likely to break if you load them too heavily or have unwrapped sharp edges, and they're hard to hold onto. Occasionally, vendors will have nice small paper bags, which are great as long as your slab isn't wet. Again, hard to hold onto, especially if you need your hands free to shop some more! BRING SMALL BILLS AND CHANGE Believe it or not, thieves and pickpockets love rock shows as much as we do; but for different reasons. Getting your wallet out every now and then means you have that many chances of putting it down and forgetting it or having it spirited away in the excitement of the moment. By keeping small bills and change in your pocket, you can pay for small purchases easily. When you get out your wallet or credit card to make larger purchases, be very aware of what's going on with them. WEAR COMFORTABLE SHOES This should go without saying until you see someone who stopped in to see the show on their way home from another, dressier event. Keep an old pair of sneakers in the trunk of your car and don't worry about how they look with your better clothes. I've never heard of a fashion blogger working a rock show! You're likely to be on your feet for a long time and the only places for visitors to sit are at the food sales area. Hot dogs anyone? BRING BUSINESS CARDS If you have a business or hobby related to rock shows, bring business cards and wear branded shirts to the show. 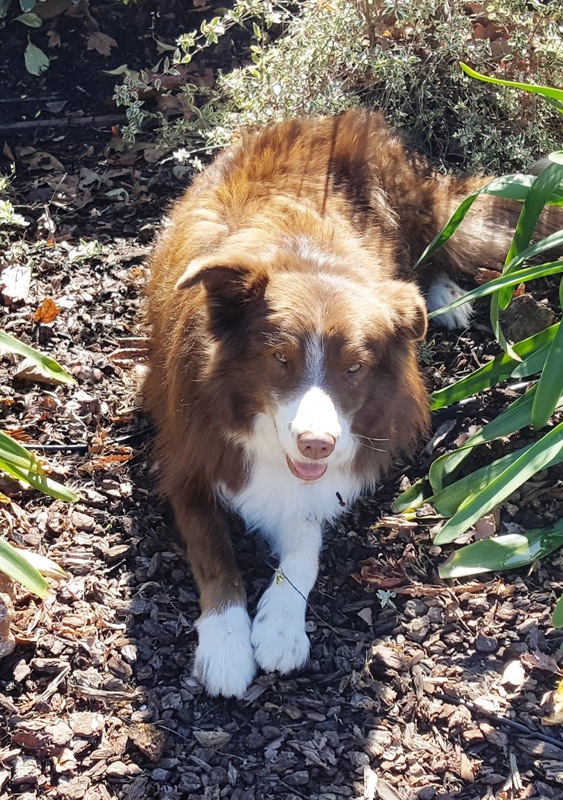 I know they have been great for starting conversations and I've picked up some information for this blog that way and brought in new readers. BRING GLOVES OR HAND SANTIZER Remember when your mother told you not to touch something because you don't know where it's been? Yeah, you're not taking that advice when that sweet slab of blue lace agate is tempting you from just underwater in that bin, right? Unfortunately, you don't know where that rock has been and it has probably been steeping in the water that every other rockhound has dipped their germy fingers into it. Thin plastic gloves, like the ones used in food service are good for that. I usually bring utility gloves also t so I don't get injured when I pick up a sharp rock. If you absolutely don't like gloves, bring some hand santizer and use it frequently. WET/DRY If a slab is wet, dry it to see if the water is hiding any cracks. If it's dry, wet it to see what kind of shine it's likely to take. I dry them on the side of my jeans. Not terribly sanitary, but nobody's perfect. 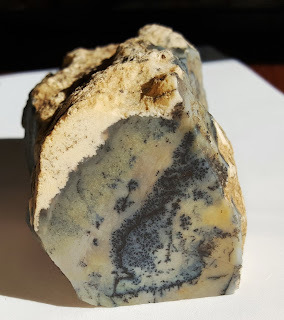 BE SKEPTICAL I've had vendors tell me their rock was one thing when even a newbie lapidarian knows is not true. Not just things like the difference between agates and jasper which can sometimes be a judgment call, I'm talking the difference between rose quartz and rhodocrosite! LISTEN TO THE ROCKS And not just because I'm the Lapidary Whisperer. While you're listening to see if that slab has something to say to you,you can be envisioning what it wants to become. If it doesn't whisper to you, maybe it really wants to be someone else's rock. * I'm looking for people who are vendors at rock shows for a project I'm working on. If you are a vendor I'd like to ask you a questions. I'm hoping to get one or two who have not been in the shows for a long time to talk about their start-up experiences. 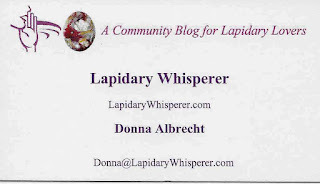 Contact me at Donna@LapidaryWhisperer.com Thanks! Have a pad of paper so you can create an emailing list for rock hounds to receive notices of up-coming shows and events. Bring a bar stool instead of just a chair. The extra height will prevent you from being hidden by your display. Bring extension cords - not every booth will have its own outlet. Bring an empty box for refuse. Bring spare litebulbs for your displays. bring the charger for your cellphone, esp. if you use it for credit card transactions. Thanks, To be able to use this in the article I'm (finally) writing for Rock & Gem, I need your name, you can also include a link to your site. I'll bet you know the exact moment you decided to get serious about lapidary. Maybe when you found a pretty rock and turned it into a cabochon, or perhaps you were inspired by a friend or parent. For me, it was an epiphany during a difficult time in my life.I was overwhelmed by physical and emotional commitments, and I realized I needed some "me" time to play. Okay, I asked myself, what was fun when I was a kid? Two things came to mind, The first was climbing trees. Not happening any more; I really hate breaking my bones. The second was rocks. As a kid, I'd loved to find rocks, try to identify rocks and squirrel them away in my dresser drawer. So, I found a lapidary club with a shop and joined. Then, the rocks and slabs started whispering to me . . . They told me their stories and how they wanted to look, and more. 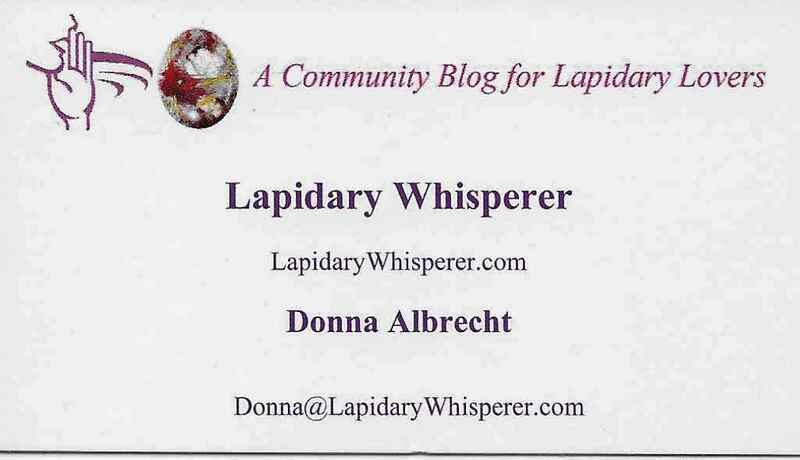 I've gotten to know a lot of wonderful people through my lapidary work and I'm looking forward to meeting more through this blog! Let me hear from you! Copyright 2017-2019 by Donna Albrecht. Simple theme. Theme images by A330Pilot. Powered by Blogger.